The first Hurricane Hunter flight took place July 27, 1943 near Galveston, TX. The flight was the result of a bet between Lt Col Joseph Duckworth and British pilots who were students of his at his instrument school at Bryan, TX. As a result of the bet, Lt Col Duckworth and his navigator Lt Ralph O’Hair deliberately flew into a hurricane, penetrated the eye, and flew home safely. Lt Col Duckworth is known as the “Father of Instrument Flying.” Instrument flight training prior to Lt Col Duckworth’s schools was lackluster. The number of losses related to flight instrument flight exceeded the losses that were the result of combat. Duckworth sought to fix this and ended up teaching both American and British airmen. Unfortunately, instrument training was looked down upon by many of the pilots. 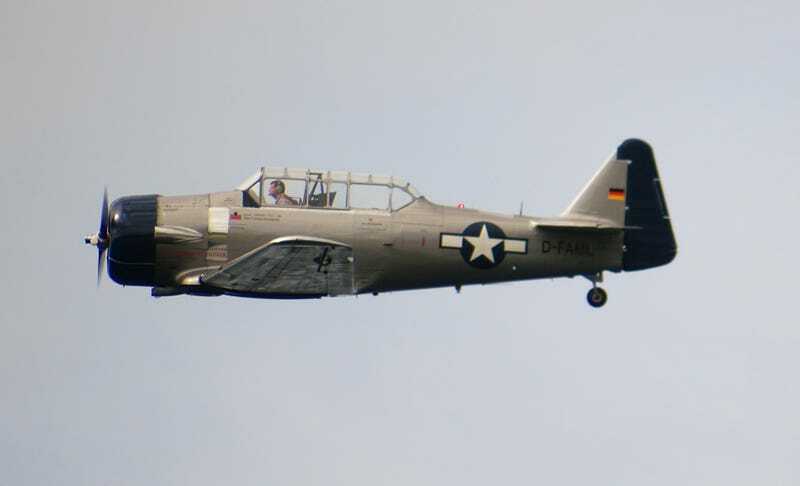 Worse, the British pilots who were being trained by Duckworth complained incessantly about the plane, the AT-6 Texan, being used for the training. They felt that as combat veterans they should be using a plane that was less flimsy and more like a proper fighter plane. Eventually Duckworth had enough of the mockery, and upon hearing news of a hurricane approaching Galveston, made his historic bet. He would prove the airworthiness of the AT-6, and he would validate instrument flying by flying into and out of a hurricane. The hurricane in question is known as the “Surprise Hurricane.” Prior to war breaking out it was ships that encountered storms would report storm sightings. For security reasons ships stopped this practice and as a result the hurricane that struck July 27 came as a surprise to those it hit, and it killed 19 people. Even now it’s hard to find any information on the storm as the various weather reports were classified at the time. This meant that Duckworth literally had no idea of what he was agreeing to fly into when he made his bet. The plan was to fly in just enough to say it was done and then fly back out. Actually flying into the eye of the hurricane was a complete accident. Duckworth intended to fly into the storm at a relatively high altitude to allow recovery time in case he stalled. Flying a single engine plane meant that his greatest threat was that the sheer amount of rain within the hurricane would cause his engine to fail. Upon reaching the eye, Duckworth and O’Hair circled for a few minutes and then flew home. Duckworth then made a second flight later that day with the base weather officer sitting in the navigator seat. Lt Col Duckworth had won his bet with the British. He had proved the airworthiness of the AT-6 Texan. He had validated the training of instrument flying. And most importantly, he inspired others to make similar flights which resulted in the "Hurricane Hunters" being created.